You can launch the Scan application using the desktop icon of the application menu. Windows: Open the Start menu and, in the Programs list, select Toon Boom Harmony 16.0 Premium > Scan. macOS: In Finder, go to Applications > Toon Boom Harmony 16.0 Premium > Scan. GNU/Linux: Select Applications > Toon Boom Harmony 16.0 Premium > Scan. Click Continue to open the Scan application. Note that you will not be able to scan. Click Exit Scan Program to quit the Scan application. If you think this message is incorrect and your computer is connected to a scanner, contact your system administrator. The database login window opens. 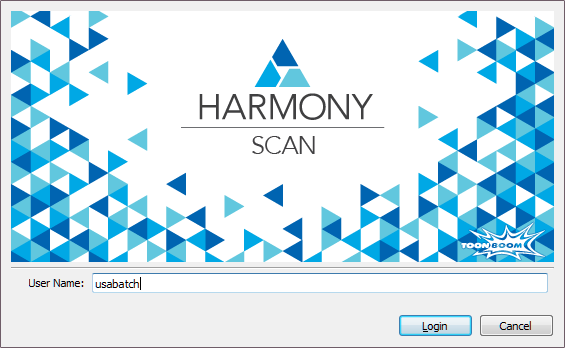 In the User Name field, enter your Harmony username.